Reminder: If asked the following questions please use these stock answers. Why are there two MCC Churches in Brighton, and how are they different? MCC is a fellowship of churches that are all very different to each other. The Village MCC is a Christian church that’s happy to identify with the LGBT Community and support it. I don’t know how MCC Brighton sees themselves, but I’m sure their website will have lots of information. Why does Andrew Ramage wear a collar, even though he’s not an ordained minister? In the UK it’s not against the law for anyone to wear a clergy collar, and our denomination now allows lay leaders to wear one. However, at The Village MCC only ordained ministers wear a clergy collar. Friday January 59th 2018 7:30pm at Keith’s home. Opening Prayer: Keith Fish opened in prayer. Minutes of the last meeting: Proposed by: Rev Michael Hydes Seconded by: Keith Fish. All in favour. Pastors Report: Rev Michael said that plans are still fluid for the 18th at the Soul Safari, and his in contact with Billie. Billie asked if we could help with food parcels. Proposed by: Simon Markham Seconded by: Keith Fish Yes All in favour. Voting in of associate Pastor: Proposed by: Rev Michael Hydes Seconded: Keith Fish All in favour. Rev Peta Evans was formally voted in. Treasurers Report: Keith said we are still holding funds evenly. And all budgeting is ok. Rev Peta inquired about a entry in the December budget, as a error. Rev Michael inquired about the amount in the pickle fund as the amount is rising. Dameon said there were no issues at the moment. Rev Peta said that they’d been unwell so hadn’t been able to do lots of the preparation work as planned. Rev. Peta Is discerning how we are going to move forward in our board visioning process. Rev Michael asked about the planned format. Rev Peta said it that the process is played out in stages. Some can be covered at board meetings and at a couple of day retreats. Rev Michael asked if Rev Peta could send him a time plan. Pickle Fund: Two payments were made in December. Safeguarding: No new issues at present. It was proposed that the lay delegate and associate pastor be included in safeguarding issues. Rev Michael explained to Dameon about safeguarding. Proposed by Keith Fish Seconded by Rev Michael. All in favour. Health and Safety: No issues. Gift Acceptance Policy: It was suggested that any member of leadership who received a gift from someone because of their position in the church should declare it if they either have any reservations or the gift is over £150. Rev Michael proposed and Keith seconded. All in favour. Board Positions: The posts of Treasurer and Secretary remain with Keith and Simon respectively. Rev. Peta will take on the role of vice chair. 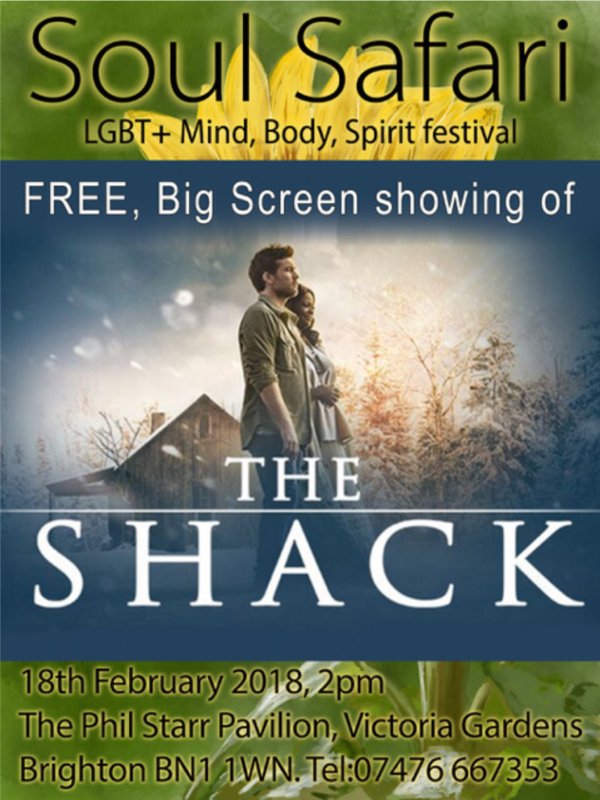 Soul Safari: Rev Michael said plans for Feb 18th remained unsettled but that the LGBT Mind Body Spirit Festival on the 25th looked to be a great event. Easter: Easter is early this year. Rev Michael said he is planning to do the sedar meal and the Good Friday walk. Working day for documentation: Rev Michael said that we had been refused charity status in the past due to how we worded documents. It was suggested we form a working party to sort it out. New changes are coming to Data Protection and anyone contacting the data base need to agree to the policy. Rev Michael said he would ask Chris about it and check a site for details. Rev Michael said he was hoping to run a raffle to help raise money for funding events. Keith said it needed a license if it was an open raffle. Nigel and Gerry will be holding a baptism event at their pool on Easter Sunday morning. On Monday Feb 24th there is a first aid at work course at the B Right On festival. It gives a three year certificate on completion. if anyone is interested let Rev Michael know. There was a board proposal to increase the stipend for Rev Michael and Rev Peta by £50 a month each. Proposed by Keith Fish. seconded by Simon Markham. All in favour. Next board meeting set for 9th February at Keith’s home. Rev. Peta to chair. During January I was fortunate enough to meet a prospective spiritual director and I think we connected well. I’m happy to be able to see my experiences in a human ‘mirror’, helping me to be able to see where I am as a pastor, and where we are as a church, with much more clarity. Our Soul Safari meeting went well and I’m looking forward to spending time with nearly a dozen contributing groups and individuals. It’s going to be fun! 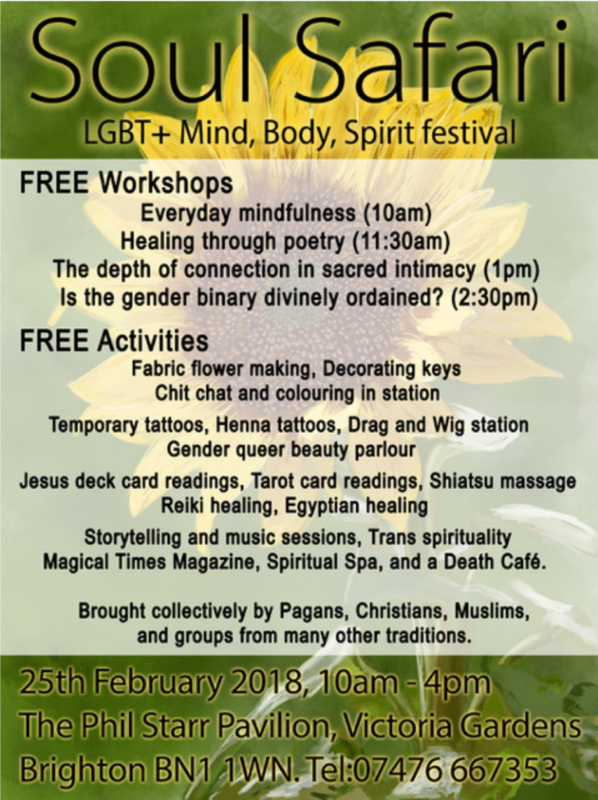 The last Queerying Christianity meeting also went well. James, Charlie, and I decided on a format for the program and booked the day centre for Wednesday evenings during Lent. We start on February 21st and run through to Holy Week, with baptisms at Nigel and Gerry’s home on Easter Sunday morning. Thank you to Charlie and James who have been instrumental in making this happen, and to everyone who has volunteered their time and space for meetings in their home to make it happen. I had a meeting with Greg Headley (The council’s homelessness point person) about the continuing homelessness situation in Brighton. Greg is going to hold a volunteer training session on Feb 18th 10:30 – 12:30. This utilizes the morning part of the Soul Safari day on the 18th. I have the OK to show the Shack in the afternoon and the licencing option we chose allows us to advertise. I will need volunteers! There are Facebook events available for all the events. Please circulate as widely as you can. I gave out three pickle fund payments on January, as well as spending time with two people who needed help accessing social care. In January I made three pastoral visits, two of which with church attendees. During January I met with Rev. Peta twice. I’m excited that Rev. Peta will be joining me in preaching the Lent series at church, and looking forward to the day retreat that they are organizing with Mary. In January I also took part in an LGBT history month youtube film celebration being presented by Brighton Council members. It should be available in a week or two. As we move into Lent and Easter I pray that you have time to reflect on the mystery of our faith. I’m looking forward to Easter, especially to the Seder meal. More details soon!